Each year, SPASA Victoria showcases excellence in the swimming pool & spa industry at the annual Awards of Excellence Gala Dinner. These prestigious awards cover a range of categories from finished pool & spa installations to the latest equipment innovations. 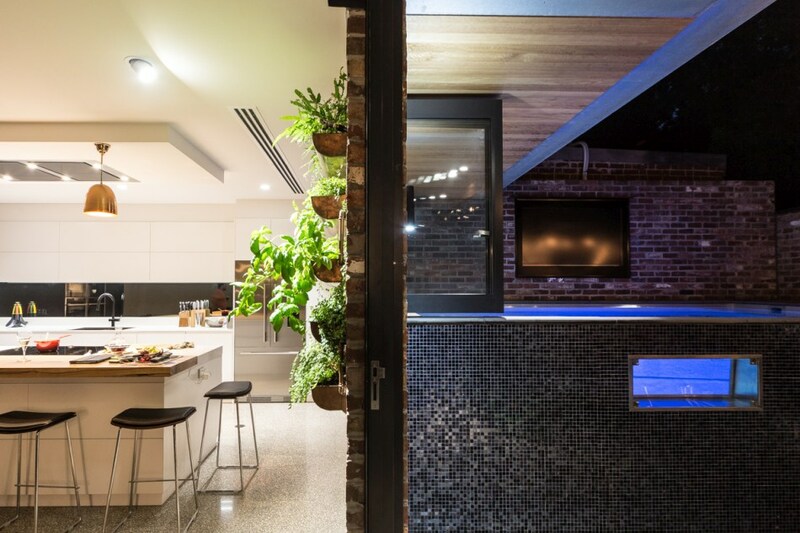 Compass Pools Melbourne, our dealer building pools in the Greater Melbourne region, has again received multiple awards this year. There are multiple categories available within this prestigious event. Judges may award a Gold and/or Highly Commended, or no award, in each category. Sitting gently in the environment, the two lanes lap pool allows multi purpose swimming. The pool features a glass wall which is still a very new technology in the fibreglass pool building industry. The customer wanted their courtyard to be part of their everyday living. Their daily life ‘lives’ with the pool – morning, noon and night. Glass panels were positioned to be ‘balanced’ with the courtyard. Paradise in the country. Living out of town this client wanted to have the swimming and aesthetic pleasures of a river or natural body of water view. They wanted the pool to sit gently yet tastefully with the view. The customer did not want a negatived edge due to the evaporation rate of the water running over the edge but did want the look of extended water view or disappearing edge. This was the reason the glass edge was added to the project. They didn’t want blue water to contradict the landscape. They wanted to enhance not contrast. Originally looking at a long lap pool they decided that they needed more lap swimming but in proportion to the large deck space. A skinny pool would look wrong in size. Hence, they made it two lanes instead of one! This site was very easy due to wide access, however, the height difference did cause some complexity. The pool was engineered by Compass Pools Australia the Maxi rib technology to allow the pool to be ‘free standing’. This pool was originally sold with the base of the pool shell sitting on the natural ground. This would have meant the client had to walk 5 or 6 steps down to the pool from the house (as the house was sitting high on the hill). The pool was then re-engineered to have a floating slab constructed so that the pool was raised to sit almost level with the finished height of the house. They didn’t want long continuous deck so they broke it up with one step down. The aim in fibreglass pool building is to make sure edges still look sharp. To do this, as the pool builder you have to combine existing manufactured practises that are not easily changed with on site adjustments. Manufactured pools do restrict the individual aspect of a look and as the builder, you need to push the boundaries of what the shell was originally designed for ‘to get the look’. An experienced fibreglass pool builder can do this and make it look like all one beautiful vessel. Glass is common with pools, but only with concrete construction. Glass has very rarely been used with fibreglass pool given the fibreglass shell is flexible by nature. Any people who wanted a ‘wow’ factor with a swimming pool always had to revert to concrete pools. PWe had the manufacturer build one edge with a ‘drop edge’ on the pool shell. Once in position, the Compass Pools Melbourne team could measure and have a custom made stainless steel channel designed.This was then fixed and sealed to the pool. The glass then sits in this and it is hidden so it doesn’t look ‘tacked’ on, The inside of the pool shell then has a matching tile to cover this edge. The client wanted the benefits of fibreglass pool with the smooth surface and ease of maintenance but was worried it would look like an old fashioned pool. By giving clients the advantages of these pools but constructing it with the ‘wow’ factor it gave them the best of both worlds. This pool was designed for regular lap swimming but they also wanted to have a pool proportion to space. They wanted it to be easy to get to (not having to walk down many steps to get to the pool). They also recognised that it enhanced their view and made them enjoy it more. When designing this pool with the client, Compass Pools Melbourne had to work out where the glass panels could be positioned so they were ‘balanced’ with the courtyard yet had to be built between the fibreglass structural support ribs. These engineered free standing support were non-negotiable as to their position. They had to work with a prefabricated product and manoeuvre it in an existing space and we needed to make it look ‘balanced’ and not have the windows ‘off centre’. This site proved to be somewhat difficult for many reasons. Inner city Melbourne (Richmond) meant that the fibreglass pool delivery had to consider trams/clearways and working in a small space. The house was existing and with the tight space in Richmond, we couldn’t have a crane lift the pool into space. They had to use two small cranes and a custom built trolley to end up wheeling it through the kitchen area into position. The pool shell is manufactured with a ‘void’ to allow them to build the glass windows. It’s important that the fibreglass shell look like one with the glass and not just ‘inserted’ in ….i.e. not two different structures. It had to blend. It is not till you explain how it’s built that people realise there is a marriage between the fibreglass and landscaping (or deck fit out & tiles) to make this look complete. The fibreglass shell was manufactured with recesses built into it. These recesses were trimmed out on site. Glass was measured up and glued into position and sealed watertight. Secondary glass window – removable for cleaning was used on the outside so that the pool would comply with fencing regulations. Glass is common with pools but previously only with concrete construction. Glass has very rarely been used with fibreglass pool given the fibreglass shell is flexible by nature. Any pool buyers who wanted a ‘wow’ factor with a swimming pool always had to revert to concrete pools construction. This is not the case anymore. This client wanted the colour of the water visual from the house. The pool was only able to be positioned free standing (due to site conditions) and they did not want to look at ‘box or wall’. It brings the pool and the life of the pool into the house. The client wanted the benefits of fibreglass pool with the smooth surface and ease of maintenance but was worried it would look like an old fashioned pool. By giving our clients the advantages of these pools but constructing with ‘wow’ factors gives them the best of both worlds. This pool is used day and night and we are not even talking about when the kids are swimming. At family meal time, the pool lights are on, the pool has in-floor cleaning so it always looks crisp and clean. It had to have infloor cleaning given it was on show every time anyone was in the kitchen. The beautiful pool colour had to be sparkling all the time. 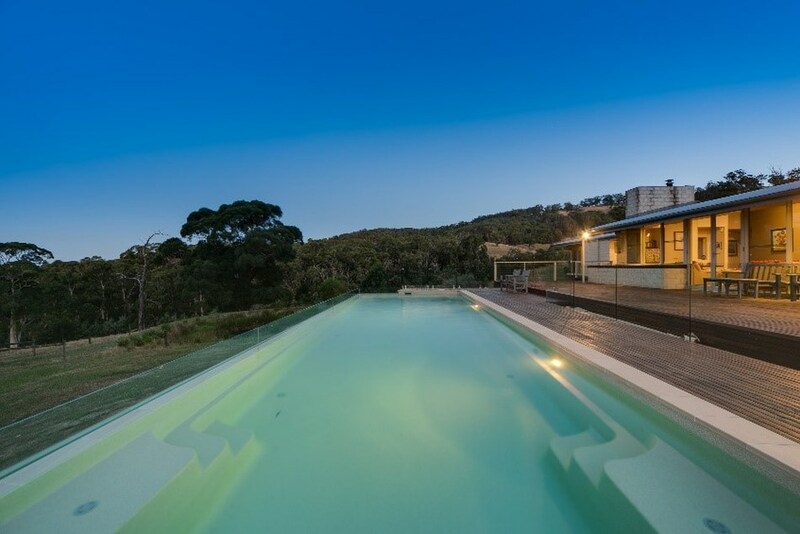 Would you like Compass Pools Melbourne to build your dream pool?